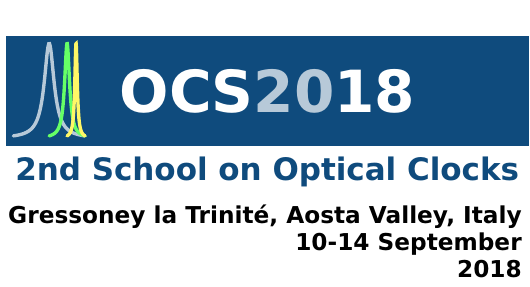 The second School on Optical Clocks (OCS2018) will be held in Gressoney la Trinité, Aosta Valley, Italy, from the 10th September to the 14th September 2018, after the success of the first edition, held in Turin in 2015. The school will be hosted by the Istituto Nazionale di Ricerca Metrologica (INRIM) with the collaboration of the main European metrology institutions and the academic partners of the project OC18 (Optical clocks with 1 x 10-18 uncertainty). Lectures will be held by leading experts from the partners in the project and by invited speakers from all over the world, covering the hottest topics in frequency metrology and atomic frequency standards. The school will be aimed at PhD students, post-docs, young scientists and engineers of the field with a strong focus on training and education. Research on optical frequency standards based on cold atoms or ions has shown a great advance in the last few years with optical clocks demonstrating unprecedented stability and accuracy and achieving 10-18 uncertainties in just hundreds of seconds. Optical clocks are the best candidates for a redefinition of the SI second in the near future, surpassing the performance of caesium primary standards. The School on Optical Clocks will offer insight on the state of the art in this field and will present the very latest results from the international community. The School will explain the efforts to achieve 1 x 10-18 uncertainties, to develop novel techniques for frequency stabilization and to ensure the reproducibility of optical clocks through direct frequency comparisons. Applications of optical clocks will be presented such as relativistic geodesy, searches for the variation of fundamental constants, space physics, tests of relativity and quantum simulations. OCS2018 is co-funded by the European Metrology Program for Innovation and Research (EMPIR) co-financed by the Participating States and from the European Union’s Horizon 2020 research and innovation programme.